And where hope has been achievable and a bit more tangible, healing has been the helpless part of the process. It’s all typically unseen. And we have no control over that process. Yet again, we return to God’s Word to remember that we are to “Praise the Lord, O my soul, and forget not all his benefits – who forgives all your sins and heals all your diseases, who redeems your life from the pit and crowns you with love and compassion…” (Psalm 103:2-4). We can rest confidently that Cole is in the hands of a God who is the Great Physician who takes delight in healing diseases. 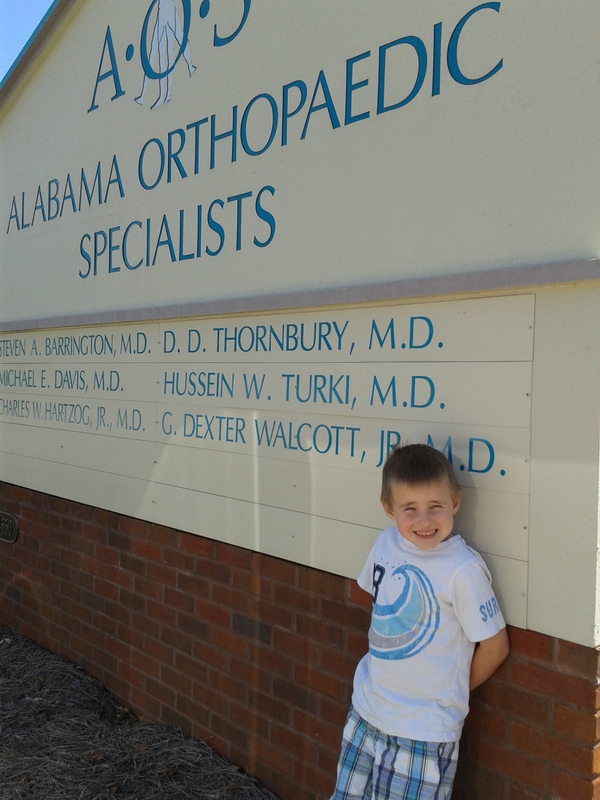 Today we travelled back to Alabama for Cole’s first visit with Dr. Killian since having his cast removed. We went in with a lot of questions and concerns, but also a hope that healing was indeed taking place. And as I sit here typing, I find myself amazed, humbled and grateful and the goodness and healing of God. Cole’s osteonomy was successful. Where his femur was cut in two in order to rotate his hip has totally fused back together and healed. He still will keep his plate and screws in for some time as the fragmentation stage of Perthes continues. The blood is re-flowing to the head of the femur and is in the process of breaking down the old dead bone to make room for the new to grow. The healing here will be years in the making. So we aren’t out of the woods yet. Dr. Killian had Cole run up and down the hall and then put him on the table to test his range of motion. He was pleased with how the walking and flexibility are at this point. We’ve had our concerns, but he alleviated many of them by sharing that Cole is on the right path. We still have to watch against heavy use, jumping or hard impacts. 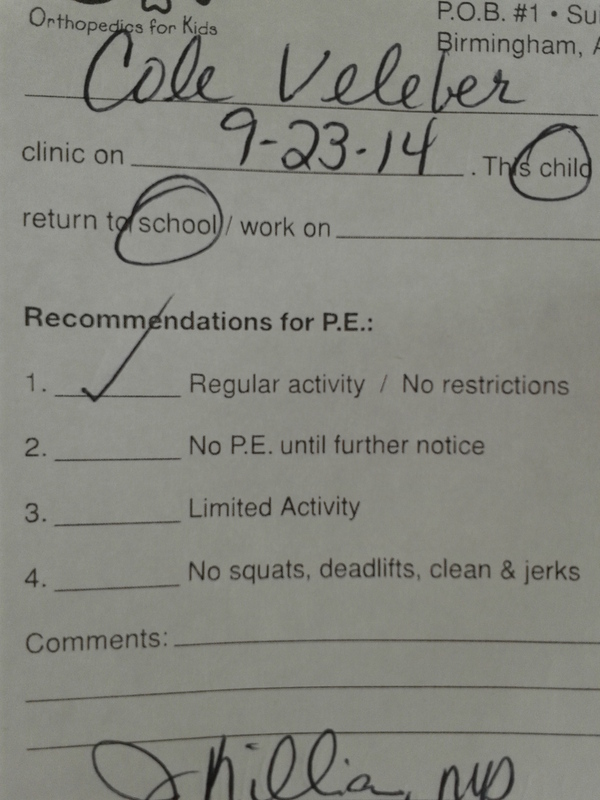 But, Cole walked out with a prescription to “return to normal physical activity” and we couldn’t believe it. He has a prescription to play, run, ride his bike and continue swimming and then Cole asked the Dr., “Does that include playing soccer” to which he replied, “Yes, it does!”. So we enter a new stage… and in this stage we say goodbye to the wheelchair and walker that have faithfully provided Cole with mobility. He’s on his own now. And while he will still continue to walk with a pronounced limp, this is all a part of the healing process. So we have so much to be thankful and grateful to God for! As the Psalmist says, “But in my distress I cried out to the Lord; yes, I prayed to my God for help. He heard me from his sanctuary; my cry to him reached his ears.” (Psalm 18:6). The hope (and healing for that matter) hasn’t always come how or when we expected. There were many days where we felt that God wasn’t hearing our prayers (and I think that will be another blog for another day). But we have known His presence… His promise to never leave us or forsake us has been tested and found true. So we rejoice in what we are able to share – that God truly has heard our prayer and has continued to develop hope in our lives and for Cole’s future. And we know and trust He hears us and answers according to His perfect purpose and plan! Praise be to God. I continue to thank Him for His merciful healing.